Over the past few years I've featured many a Latest in Beauty box because they are one of my favourites when it comes to beauty boxes. They have the benefit of being one-off boxes so therefore a one-off payment and they offer incredible value for money. 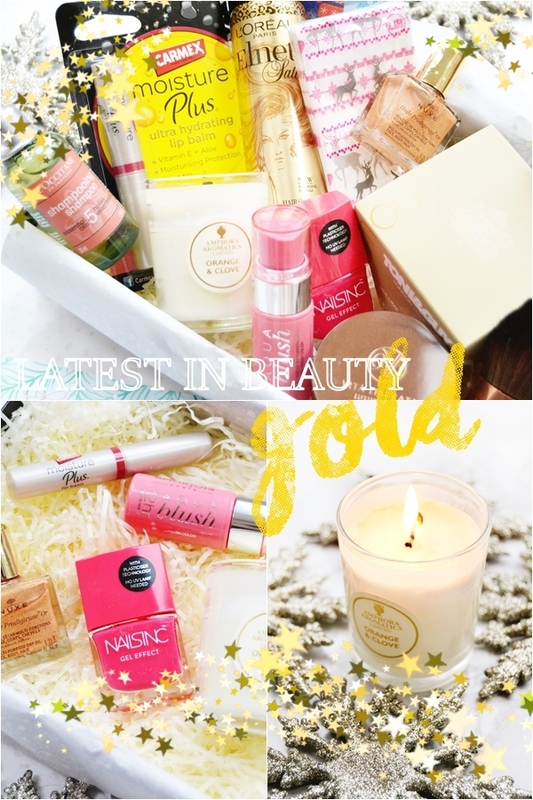 Here I have the amazing Gold Box that is limited edition for Christmas 2015 and is literally stuffed with 14 products, including a few extra Christmas themed treats! Bourjois Aqua Blush (full size), Carmex Moisture Lip Balm in Berry (full size), L'Occitane Repairing Shampoo & Conditioner (mini sizes), Nails Inc Gell Effect Nail Polish (full size), Nuxe Huile Prodigieuse Or (mini size), Vita Liberata Luxury Tan Minerals with full size brush (mini size), Toni & Guy Volume Whip (mini size), L'Oreal Elnett Satin (mini size), Amphora Aromatics Orange & Clove Candle (travel size), Latest in Beauty Christmas tissues & two Christmas nail files. Worth over £80! But only £24.95 to buy from the Latest in Beauty website here. As you can see this box is stuffed full of amazing products from both budget and luxury beauty brands. Other than the odd product (I'm looking at you Tony & Guy Volume Whip and boring Elnett Hairspray) I know I will use all of the products over the coming months, but I do have quite a few favourites in this box! Of course I love that the box contains a full size Nail Inc Gel Nail Polish, I received Covent Garden Place, and one of my favourite tint lip balms in the Carmex Moisture Balm in a shade I have yet to try! These are just perfect for winter lips. I also love that I finally get to try out one of the Aqua Blushes from Bourjois, again full size, in fact I'm already loving it. I've also been burning the lovely Orange & Clove candle which is perfect for the festive season and fills the room with a warmed orange spice scent which is just gorgeous. And lastly an ultimate favourites is the Vita Liberta Kabuki Brush... I already own one of these but I'm sooo not complaining that I now have two as these are the softest kabuki brushes I've ever felt and they really are so luxurious feeling - love, love, love! As for the other Christmas themed items to the box I feel this is a nice touch and does make it feel like a festive box compare to all the other beauty boxes out there this month. Of course the tissues will be going straight in my handbag and I'm tempted to put the nail files in some DIY crackers I plan to make or just as a little stocking filler for someone. As for the cute Christmas card I also plan to be savvy with that and frame it and display it in my hallway - but of course you could actually use it as a Christmas card. Overall this really is an incredible box for the money, with such a saving! But most importantly all the products are items that can easily slot into your beauty routine and I think most will enjoy using. Also a few of these products would work as excellent stocking fillers. 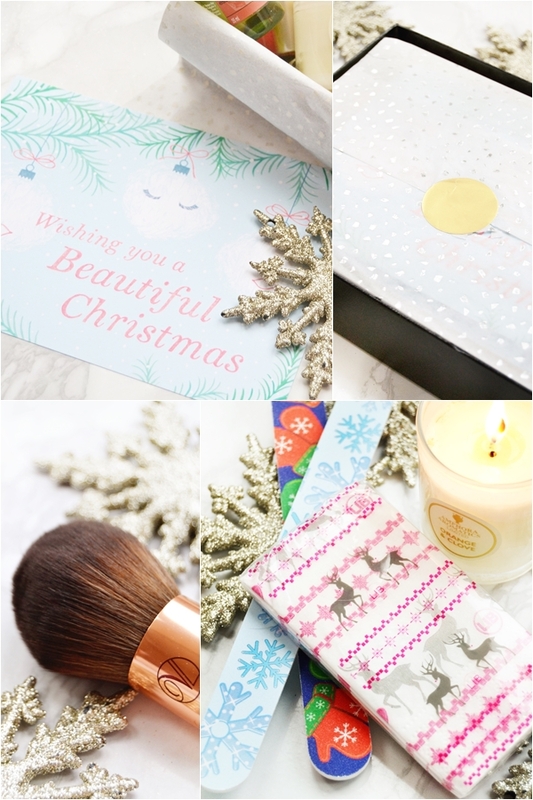 If you are thinking of treating yourself to one beauty box this Christmas make it this one!